With creative activities , there’s always something that sparks the imagination to get the ball rolling. First, let me tell you that I find quilting to be a very creative activity. There are so many decisions to make during the process: how wide should the border be, what colors to put next to each other, how to bind or edge the quilt, and on and on. Second, since it’s creative, I need some inspiration and that’s where The Patchwork Girl of Oz came in. 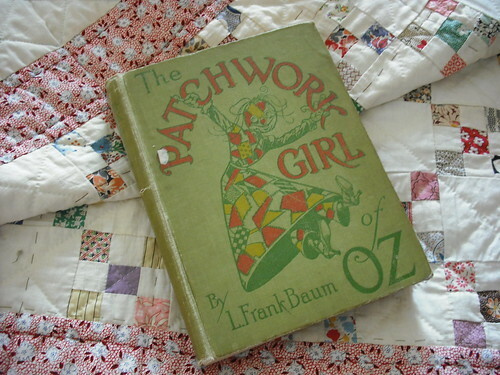 At a very young age, my parents read The Patchwork Girl of Oz by L. Frank Baum to me. The Patchwork Girl herself was rather spoiled, maybe even narcissistic. However, since she was made from a crazy quilt, it peeked my interest in quilts and quilting. So I started to badger, yes that’s right, badger my grandmother to make a crazy quilt for me. I had no idea what a crazy quilt was, but I wanted one! So, unbeknown to me she started a quilt. At the time, she was getting on in years and had moved into a ‘home’. This was around 1950. Her hands were old and stiff with arthritis and resources were limited. She had never made a crazy quilt, so she did the only pattern she knew well, a basic nine patch. She gathered old shirts from other residents, cut them into tiny pieces (no pattern here, just years of practice), and pulled out seams. Then slowly she began to assemble them into a work of art. Years later, after she was gone, I would discover her work of love, carefully tucked away, and begin my own journey, finishing what she had started so long ago. It took me quite a while to research how to work with a vintage quilt top. Then it took me much longer to determine how to add a border, what fabric to use, how to quilt it (I did it all by hand as she had pieced it), and finally what fabric to use for the binding. What you see in these photos is coming down to the final stretch. 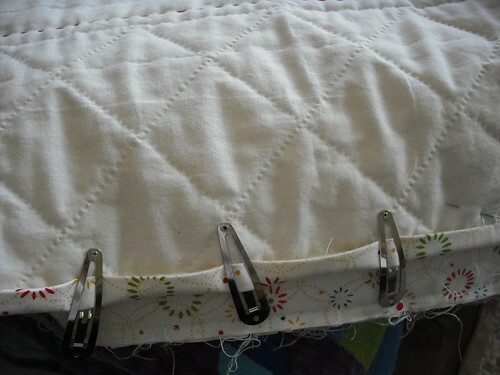 I used quilt clips to hold the binding in place as I stitched. They made that task a snap. In my next blog post, I’ll share some great tips I picked up and images of the finished quilt!